Santa Cruz Guerilla Drive-In is an outdoor movie theater under the stars that springs up in unexpected corners of the semi-urban landscape. This Autumn GDI presents a series of three films, co-hosted with Streetlight Records at the Felix Kulpa Gallery. It’s the last Friday of the month, August through October. BRING blankets, pillows, beach chairs, friends, drink, and snacks, whatever you need to be comfy outdoors. Donations to support the project are more than welcome. A few foldy chairs will be available. 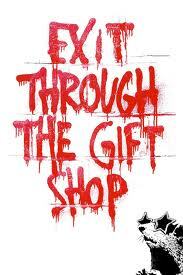 Exit Through the Gift Shop is the inside story of street art and a brutal and revealing account of what happens when fame, money and vandalism collide. The movie follows an eccentric shop-keeper turned amateur film-maker as he attempts to capture many o fhte world’s most infamous vandals on camera, only to have the infamous British stencil artist Banksy turn the camcorder back on its owner. Or maybe not…? This is a horror film. But, it’s also romantic, haunting, quiet and subtle, eerily beautiful, and it’s about child vampires in the dark Swedish Winter. The story takes place in a suburb of Stockholm during the 1980’s where a shy 12-year-old boy befriends a mysterious child who lives nearby. 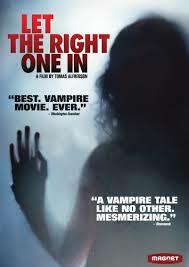 **There is not much gore in this film, but it’s probably too much for little kids or squeamish adults.